clay and limestone: Q: So Tell Me, How Much Rain Have You Had? Q: So Tell Me, How Much Rain Have You Had? A few hours of sunshine! Echinacea cotyledon popping up on the seedheads. That's a lot of rain! It sure proves that the seeds on this flower head are fertile. with the Tennessee Coneflowers on the other side. The offspring could be very interesting! bees will cross pollinate all them. and plant them someplace safe from the pouring rain? and to feed the bees. more to transplant to other spots in the garden. and False Dragonhead is cooperating nicely. Pardon My Big Aster ~Aster tataricus does not refer to the size of the flowers, but to the height of the stalks. hovering around 7 to 8 feet tall! To take these photos I had to stand on a chair. You know, we've had so much rain that digging and dividing ought to be easy! Q: So, how much rain have we had? A: We've had so much rain, that my house is getting clean! I don't know how much, I've lost count on how many inches! Too much is my best answer! That's pretty neat that the coneflowers are sprouting new plants on the seedheads! Better cut them off and put them in the ground to grow more for next year! Dave, That's exactly what I want to do! I'll plant them today! We had another 2 inches of rain over the last day...The only thing that saves the flowers is the tree canopy. The forecast doesn't look any better! Monica, How did you get our weather! Yikes, isn't climate change fun! So enjoyed catching up and viewing your lovely garden, Gail ... I drained my cup of coffee, hating to leave :) You have a gift for making all feel right at home! BIG HUGS and thank you for your comforting words these past few weeks ... you are a true friend and I'm blessed to know you. Well, that is a lot of rain! What a great photo with the germinating echinacea! We've had no more rain, after the freak storm a few weeks ago, and likely won't have any for a little while. But it's supposed to be an El Nino year, so we might get wet. I feel kind of bad. We have had the least amount of rain a rain forest can have all summer. Somewhere over the rainbow, everyone else got our share this year. We had a unusual and hot summer. Sorry. But your garden looks lovely. Love your "tall" flowers. It must be so nice to be able to sit on the porch & see them. Gail I just read your comment on your condition. So that's what I have in my thumbs. Is it possible to have it in your shoulders? I knew I had it in my elbows. All I know it is very painful. It's either flood or famine, Gail. Send us some rain up here. We've had the wettest Spring and driest Summer in many moons.. Unfortunately all that rain in Tennessee, Alabama and Georgia caused some fatalities which makes me sad to hear. A gardener with a clean house? That was indeed a lot of rain. That is a boatload of rain. I have never seen flowers germinate on another, bizarre! But I am amateur, so this could happen all the time. IT's new to me. Love the sky shot, I love rain. I need to move where it rains. Wow, that's quite remarkable, seeds germinating while still on the flower. Frankly, I'm surprised it hasn't flooded. I guess it's fortunately that were didn't get it as bad as Georgia. Aha, so that's where all the rain has gone coz over here we haven't got any lately and there's a bit of a draught going on. Don't think we ever had one in september. Not too much around here. I bet your house is spotless!! The False Dragonhead is a very interesting plant. Lovely bloom. Yow, Gail, I think I'd better call my father down in Nashville and make sure he's still afloat! I thought we'd had a ton of rain here (I only had to water the gardens twice all summer! ), but it sounds like you all are taking the prize. And who'd ever have imagined those echinacea seeds germinating in situ? If I were you, I'd simply lay those flower heads on the ground, maybe cover them with a very light coat of straw, and then see what happens. Fun!!! We've had so much rain that my house SHOULD be getting clean. But that hasn't happened yet. We've had bouts of just threatening rain lately so I run outside and do a few things. Those coneflower cotyledons are so cool. I do hope you can get them planted to see what they turn out like. Our forecast - rain until next week. We have only had a couple of inches of rain. Not enough to keep me in long enough to get a clean house, just a dusted livingroom. I have a big tall aster too. It is a native. I think it is the same as yours. I don't think I have ever seen a flower that has had its own plant germinating on itself. WOW. Wow, that's a serious amount of rain! My what a big Aster you have! Too funny. That seedhead that has little seedlings germinating is really incredible. I may clip the picture to share with the extension agent as a show and tell --if you don't mind? I love the flower heads germinating their seeds right on the plant. Never knew that could happen. Your asters are humongous. "We've had so much rain, that my house is getting clean!" That's hilarious. I have also noticed a direct inverse relationship between how the garden looks and how the house looks. That is sooo freaky! I've also never seen Coneflower seeds germinate on the heads. You need more goldfinches to clean that up before you get any more. It's possible that your Aster tataricus is 'Jin Dai,' but it has bolted with the extra moisture, just like my Japanese Anemones did last year. Your last answer really makes it clear just how much rain you've had. We have had very little rain all summer and many plants are and have really struggled so have I trying to water. The seedlings on the Echinacea are amazing to see and all the photos are lovely. Good Q. I'm so happy for you - you've got great seeds on your coneflowers, and your asters are taller than you AND your house is clean. I can so clearly remember all you TN bloggers talking about the awful drought last year. So I assume you're happy about all the rain? Your flowers are just lovely. False dragonhead is nice and glad to know they met your goal for a strong presence.Don't you love it when that happens! I have been thiking of you every time I hear about rain in your area-which has been a lot lately. :)Hopefully, you are not getting flooded out like some. Gotta love those asters when they reach their full height. 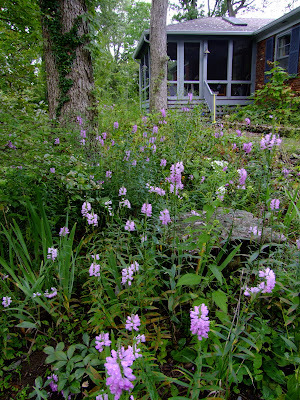 And your plan to plant masses of False dragonhead seems to be working very well. The seedhead germination is really cool...and I will plant the heads tomorrow. There's a 60% change of rain!~~ We are way caught up on our rainfall and all of us getting lots of rain in the Southeastern USA are more than willing to share it with folks far and wide. It's been a long time since the 'water larders' were this full. Not only is my house getting cleaned, but I've started a painting project. Thank you meems and congrats to you on your nomination! Gail - at my new country home it has rained daily for weeks. Raining at this moment. So much I want to do. Know I am not in this alone. Everything I moved from the city garden is doing great. Now city home sell so I do not have to be driving to Nashville weekly. Have you noticed mushrooms popping up with all this rain? I just did a post on that. To answer your question, last week we got over 5" and so far this week, we've had 4" and more is predicted. Is this what the Pacific NW is like? That's wild with the seedheads! It's so great that you found something so special and unique out of something as challenging as ridiculous amounts of rain! LOL, it would take a lot of rainy days to get my house clean:) Love your big aster! But thanks for the confession; I think I would have to make sure I had just the right place before planting one. I've never seen coneflowers germinating like this before--you have had a lot of rain! As for us, we could use a little more. I hope that other than some anomalies in the garden that the rain isn't causing you any serious problems. I've never seen anything like the seedheads germinating on themselves. I love the dragonhead and asters, both look happy about the rain. Most cool on the seeds! I think we've had about 3 inches. I was doing some serious digging today and I can for sure say the ground is NOT saturated. Glad more is on its way to us to water in those new plants. Love the rain but really we do need some sun. Hee! Hee! Hee! Pardon my big Aster! Love it! We have had rain all week long, and I haven't heard how much we have gotten so far, but I haven't heard anyone complain with the drought and hot temps we have had. That is an amazing shot of the coneflowers sprouting on it's own head! I bet you will be able to transplant them. Hi Gail, we had a very dry month but the rain from your area is finally getting here. We've only had an inch and a half so far but more is expected at week's end. How very odd about the seeds sprouting on the seed head. Rained here at last! Four inches on the garden on Tuesday and just a bit in the basement. But it's been too dry for any plant antics like you are experiencing. Wow that is some rainfall you've had! We had 5 inches in 1 day earlier this month. We got about an inch yesterday and it was appreciated as well. :) The seed heads sprouting is just too cool Gail. Oh my word Gail!! We are starving for rain!! We have given up on watering with the hose..I haven't the energy and my master gardener natureboy just seems to forget.Next year a sprinkler system for sure he says!Your garden and flowers doing so well is just refreshing to see! Oh so many wonderful images..and all those seeds and that buzy bee!! This was a delightful post! Gail, so sorry you are having so much rain - perhaps you have ours? I cannot believe the images of the seeds germinating on the seedheads, what an amazing shot. Lovely pictures of your plants. WOW, Gail ~ that IS a LOT of rain! I've never seen seeds sprout from the tops of echinaceas either and we had (what I thought was) a boatload of rain this summer too. I guess it wasn't enough to pull off a feat like in your garden. That is too cool. The big aster is phenomenal. I remember your post about it last year and how clever your title was. I hope we both dry out a little so we can get out there and do some work. We've been grateful for the extra rain in the Piedmont of SC,to be sure, even if it did come in deluges. There were interesting mushrooms popping up everywhere. There's dry weather now, but maybe just for awhile. I have seen some weather reports talking about all the rain, and saw Tennessee on them. We're having cool temperatures, but not much rain here in Nebraska. Your baby coneflower plants are interesting. gail, we had not much rain this monsoon and it affected not only crops but other Env. factors as well. I am stunned to see the echinacea blooms. Aren't they wonderful. thanks for sharing these beauties with us. Well, enjoy that rain while you can get it. At least you aren't under seige like Atlanta, or still waiting like we are. We actually did get a little rain recently, and are appreciating the total one inch of rain that has fallen in September. Just one inch! I'll be glad when I can stop dragging the hose around the yard! I've never seen seeds germinating right on the seedhead before. Weird!